Cardiovascular disease and sepsis are the leading causes of death in long-term dialysis patients. Causes of fatal sepsis include peritonitis complicating peritoneal dialysis and Staph. 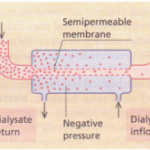 aureus infection (including endocarditis) complicating the use of indwelling access devices for haemodialysis. DIALYSIS AMYLOIDOSIS is caused by the accumulation of amyloid protein as a result of failure of clearance of f32-microglobulin, a molecule of 11.8 kDa. This protein is the light chain of the class I HLA antigens and is normally freely filtered at the glomerulus but is not removed by cellulose-based haemodialysis membranes. Complement activation resulting from the use of cellulose-based membranes may increase the generation rate of the protein. The protein polymerizes to form amyloid deposits, which may cause median nerve compression in the carpal tunnel or a dialysis arthropathy-a clinical syndrome of pain and disabling stiffness in the shoulders, hips, hands, wrists and knees. f32-Microglobulin-related amyloid may be demonstrated in the synovium. There is little inflammation and the pathogenesis is ill understood. Rapid improvement after renal transplantation is probably due to steroid therapy. Low-dose prednisolone alone can also cause an improvement. A change to a biocompatible synthetic membrane has also been reported to be of benefit: again, the mechanism for this improvement is not clear. Amyloid deposits can also cause pathological bone cysts and fractures, pseudotumours and gastrointestinal bleeding caused by amyloid deposition around submucosal blood vessels. The extent of amyloid deposition is best assessed by nuclear imaging, either using [99ffiTclDMSA, or, more specifically, by the use of radiolabelled serum amyloid P component. Successful renal transplantation offers the potential for complete rehabilitation in end-stage renal failure. It allows freedom from dietary and fluid restriction, anaemia and infertility are corrected and the need for parathyroidectomy is reduced. 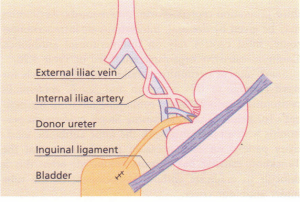 The technique involves the anastomosis of an explanted human kidney, either from a cadaveric donor or, less frequently, from a living close relative, on to the iliac vessels of the recipient. 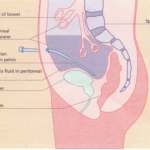 The donor ureter is placed into the recipient’s bladder. Unless the donor is genetically identical (i.e. an identical twin), immunosuppressive treatment is needed, for as long as the transplant remains in place, to prevent rejection. Eighty per cent of grafts now survive for 5-10 years in the best centres, and 60% for 10-30 years. MATCHING DONOR AND RECIPIENT FOR HLA TYPE. DR matching appears to have the most impact on survival, followed by the B and, least importantly, the A loci. Complete compatibility at A, B and DR offers the best chance of success, and this has led to nationwide matching schemes for kidneys retrieved from cadaver donors. PREOPERATIVE BLOOD TRANSFUSION appears to exert a non-specific immunosuppressive effect, decreasing the incidence of rejection; however this effect is modest compared to the immunosuppressive effects of cyclosporin, and blood transfusion carries a risk of HLA sensitization. THE ‘CENTRE EFFECT’: graft survival is higher in those entres with extensive experience of medical management of transplant recipients. CADAVERIC DONATION. Most countries allow the removal of kidneys and other organs from patients who have suffered irretrievable brain damage (‘brain stem death’) while their hearts are still beating. LIVING RELATED DONA TION. Occasionally a close relative may volunteer as a potential donor. A sibling donor may be HLA identical or share one or no haplotypes with the potential recipient. Most transplant centres accept one haplotype matches as well as HLA-identical donors. Most avoid using child-to-parent donation unless the circumstances are exceptional. Potential living related donors are subjected to an intensive preoperative evaluation, including clinical examination and measurement of renal function, tests for carriage of hepatitis B, C, HIV and cytomegalovirus, and detailed imaging of renal anatomy with IVU and then arteriography, to be sure that transplantation will be technically feasible. Long-term drug treatment for the prevention of rejectionis employed in all cases apart from living related donation from an identical twin. Some degree of immunological tolerance does develop, and the risk of rejection is highest in the first 3 months after transplantation. A combination of immunosuppressive drugs is usually used. CORTICOSTEROIDS have a non-specific immunosuppressive action. High-dose methylprednisolone is used as the primary treatment for acute rejection. AZATHIOPRINE prevents cell-mediated rejection by interfering with nucleic acid synthesis and preventing replication of lymphocytes. Adverse effects include suppression of red cell and platelet production and an increased incidence of infections (particularly viral). CYCLOSPORIN prevents the activation ofT lymphocytes in response to new antigens and is highly effective in preventing rejection, while leaving the function of the rest of the immune system largely intact. Its introduction has revolutionized organ transplantation. Disadvantages include variable bioavailability, high cost and nephrotoxicity. 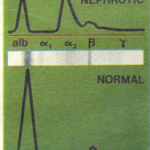 Even with careful adjustment of the dose in response to trough blood levels, renal function may be adversely affected due to renal vasoconstriction which may result in irreversible interstitial fibrosis. NEW IMMUNOSUPPRESSIVE AGENTS such as FKS06 and rapamycin are becoming available and are undergoing clinical trials. ANTIBODIES AGAINST T CELLS are potent and relatively specific immunosuppressive agents whose role is increasing. Antibodies may be polyclonal or monoclonal, derived from mouse, rabbit, horse, or ‘humanized’, and directed against any of a number of lymphocycte surface marker proteins, enabling neutralization or killing oflymphocytes with certain functions, e.g. T cells, activated T cells, cells expressing adhesion molecules, cells expressing the interleukin-2 receptor. These antibodies may be used both in the prevention and the treatment of rejection, but are highly immunosuppressive; some may increase the risk of virus-associated malignancy, e.g. lymphomas. OPPORTUNISTIC INFECTIONS, e.g. Pneumocystis, cytomegalovirus. LIPID ABNORMALITIES and a high risk of cardiovascular events. HYPERTE sION-often attributable to cyclosporin. 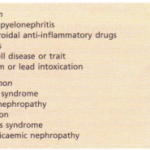 RECURRENCE OF THE DISEASE WHICH CAUSED RENAL FAILURE-this is uncommon but may occur in specific diseases, e.g. primary oxalosis, mesangiocapillary glomerulonephritis, focal segmental glomerulosclerosis, Goodpasture’s syndrome. DE NOVO GLOMERULO EPHRITIS in the grafted kidney. MALIGNANCY, particularly lymphomas and skin cancers- these are often attributable to viral induction of malignancy. ASEPTIC NECROSIS OF BONE resulting from high-dose corticosteroid treatment. For the majority of patients with end-stage renal failure a renal transplant is the treatment of choice, but because of the limited availability of donor organs many patients remain on dialysis for years while waiting for a transplant. Sensitization to HLA antigens, for instance by pregnancy, blood transfusion or a previous failed transplant, makes finding a compatible organ more difficult. In addition, there are a number of patients who are thought unsuitable for transplantation, e.g. The choice between CAPD and haemodialysis is influenced by medical, social, psychological and. financial factors. Nearly all renal units offer a choice of modalities. 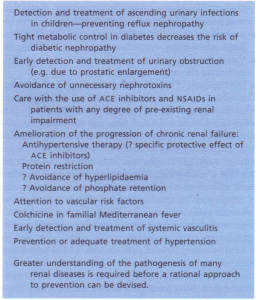 Prevention of chronic renal failure.